Last month, Nebraska suffered its worst flooding crisis since 1950. Homes were lost, farms irreparably damaged, roads closed and fractured throughout the eastern part of the state. Dispatchers in that region have been going above and beyond to service the area and their struggling citizens. These folks have put public safety first. 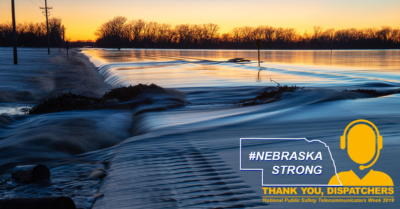 For Nebraska, it is a season of perseverance despite the devastation, and it wouldn’t be possible without the local PSAPs and dedicated dispatchers. Error: Error validating access token: Session has expired on Sunday, 25-Nov-18 07:12:05 PST. The current time is Friday, 26-Apr-19 05:09:49 PDT.